Turning 7000 RPMs would be very impressive especially in a stock 1978 Corvette with an L48. The only problem is that if you look at the speedometer, you can see that we are not moving. These impressive numbers were not even achieved at an idle. The motor was shut off! When we did start the engine, the tachometer would read 2500 RPMs at an idle then fluctuate from 0 to 4500 RPMs constantly. Whenever the engine was turned off, it would sometimes read 1000 RPMs. Other times, 7000. The problem is a defective tachometer circuit board. Beginning in 1975, Corvettes started using electronic tachometers. When these tachs start to malfunction, the problem usually is the circuit board. This is a very easy problem to fix and just about anyone can do it. Start by making a phone call or ordering online at Zip Corvette Parts, 8067 Fast Lane, Mechanicsville, VA 23111, 1-800-962-9632. They can supply you with any of the Corvette tachometer circuit boards along with any lens or bezel you may need. Now let’s get your trusty screwdriver and repair that tached-out tachometer. 01: Start the dis-assembly by removing the speedometer lens. It is held in by regular Phillips screws. The speedometer bezel is next. It is held in by Allen head screws. The bezel should come out in one piece. As you can see, this Corvette’s previous owner had already broken ours in two. 02: Remove the Corvette tachometer to housing screws. Grasp both sides of the tachometer and gently pull it out of the housing. There are three contact studs that hold it into the connection. 03: The circuit board is bolted to the back of the Corvette tach. If you look very closely, you can see a dark area on the circuit board. This is where it became hot and damaged the board. It also damaged some of the contacts. All of this caused the tach problems we had in our Corvette. 04: Remove the board from the tach and then remove the three contact studs. No new screws are provided with the new circuit board so you will have to re-use the old ones. 05: All of the nuts go on the solder side of the board. Install the three contact studs into the board and snug them into place. Mount the circuit board onto the tach studs and tighten them into place. 06: We removed the indicator light panel from the old broken bezel and then installed it in our new one. It fits over existing tabs. 07: While we were at it, we checked all of the dash bulbs. They are much easier to replace now then later. You can buy them at Zip here – 1968-1982 Corvette Light Bulbs. 08: Align the three contact studs on the tachometer with the three contact clips in the housing. Once they are aligned, gently push the tach into place. Now re-install the tach to housing retaining screws. Check the tach’s operation before you re-install the bezel and lens. If everything checks out, you are almost done. 09: Re-install the bezel and lens and you are finished. It is that easy. Now go get out on the road, hit the gas in your Corvette and tach up that tachometer. 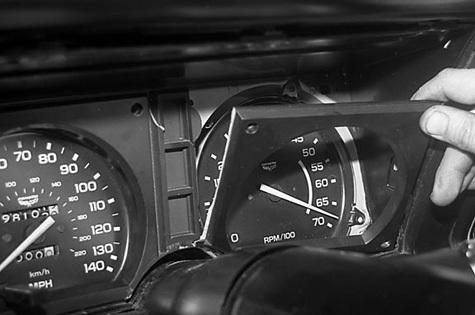 When the ignition is turned on, the tach should read Zero. If it does not, you will have to zero the needle yourself. Carefully remove the needle. Use your thumb and forefinger to gently pull it off the shaft. Turn the ignition on and install the needle so that it reads Zero. If the needle reads between 1000-1500 RPMs with the ignition off, do not worry, this is normal. The tach does not work with the engine running: Turn the ignition on. If the tach reads Zero, the problem is in the distributor or the wire coming from the distributor. Tach needle does not move: The problem can be that the 12Volt or ground connections are missing to the tach. Check the main wiring connection to the tachometer and speedometer housing.